Book for two nights in April or May and Receive a Complimentary Bottle of Estate Grown Wine! Call direct for this special deal. Not available online. Perfect for a Romantic Getaway, an escape from the city or as a base to explore the Daylesford & Macedon Ranges Region. LCD TV’s, DVD’s, books, CD’s, Magazines, all there for you. Check-out is a leisurely 11:00 a.m. Enjoy the Romance of a vineyard cottage. Full breakfast provisions are in your room on arrival. Sleep in, cook a hot breakfast or go for a walk through the vineyard first. You’re in charge. Join in the seasonal vineyard activities if you wish! 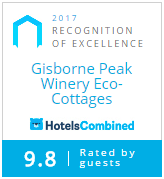 Gisborne Peak Winery Cottages were established to give visitors to the region an authentic vineyard experience in a totally self-contained cottage. Guests can settle in to a private self-contained cottage situated above the vineyard with sweeping views of countryside. Immerse yourself in country-style living with vineyard walks, native bird watching and identifying the native plants and trees surrounding the cottages. The views, the comfort, the setting and the relaxation. ​Located on 18 acres of land, 13 of which are planted to Chardonnay, Pinot Noir, Semillon and Riesling vines, you will find seclusion, tranquility and privacy. You set your own pace. The winery cellar door is just a short stroll down the hill where you can indulge in wood-fired pizzas, baked brie, beer-battered flathead tails and the food-lovers Peak Tasters Plate. Wine tasting is free for our cottage guests and includes estate grown wines and our second label, Peak Wines. Lunch is served every day along with espresso coffee and desserts. All this, yet set in an ‘off-grid’ block. The cottages are powered by the sun and the wind. The cottage site utilizes the latest technology in inverters and battery storage to ensure the site is sustainable and kind to the environment. It is a place where luxury, fine food, excellent wines and sustainability all come together in one place. The cellar door is a short walk away. The cellar door is open 7-days a week (daytime only) and serves delicious wood-fired pizzas everyday along with other food and the Peak Platter. Dessert and espresso coffee? All available daily. Dinner is not served at the Winery. There are plenty of options in Gisborne (7km), Sunbury, Woodend and Kyneton. Gift vouchers are available for a Romantic Getaway Gift. Each of the 4 cottages sleep two adults only. For rates, availability and bookings click on the above button or phone direct for best rates!
. Sorry, the cottages are not suitable for children, babies or pets. Beautiful place, service and people. The cottage was well appointed, cosy and comfortable.The supplied breakfast provisions were generous and delicious. Am impressed with the eco friendly nature of the cottages and how that didn't impact their functionality. Stayed for 3 nights and fully enjoyed the beautiful calm surroundings. Spent one lunch in the café, the pizza with the Riesling was excellent. A perfect afternoon to spend talking with new friends and just taking in the quiet surroundings. If you're looking for a quiet weekend with good amentities and staff I fully recommend Gisborne Peaks. We spent the week in Melbourne and on the Mornington Peninsula; this was a step up and thoroughly unexpected - The rooms were awesome and quaint at the same time - The view and the ambience was without peer. The staff could not be more helpful - it probably pays to be polite. We will definitely be back.